Just as it occurs with a computer, your iPad, eventually, also accumulate a few needless files. This occurs because smart phones and tablets will be more and more powerful to meet up with the needs of people that acquire such devices. They store different caches this way like remnants of applications and cookies (iTunes, for example, generates files when syncing isn't completed). To clean up those files from the device, Therefore, ideally, you'll do some sweeping every once in a while. Your gadget may have more memory to try and do apps, see the internet, and play heavy games while eliminating these caches and temporary files. iPad Cleaner tool will make cleaning possible and very quickly. Here we compared 5 top best iPad cleaner software that will help you clean up iOS devices. iMyFone Umate Pro or iMyFone Umate Pro for Mac is a very interesting tool for people who use iOS devices. It is feasible to implement fast and deep cleans about the iPhone or iPad to increase free disk space and performance to the iOS users. Combines 25+ analyzation techniques to eliminate over 30 kinds of hidden junk files and temporary files. All-in-one iPad photo manager: lossless compression for all photos, export/back up all phtoos to PC, delete photos in bulk. Totally, iMyFone Umate features a great performance, working very quickly. The interface is well organized and informative, with icons on the home screen and procedures in specific functions. This makes the app pleasant to work with. If you want to clear up or delete music on your iPhone/iPad, please try this iPhone music transfer, which can freely transfer iOS music between iPhone and iTunes/PC, as well as delete and export iOS music. 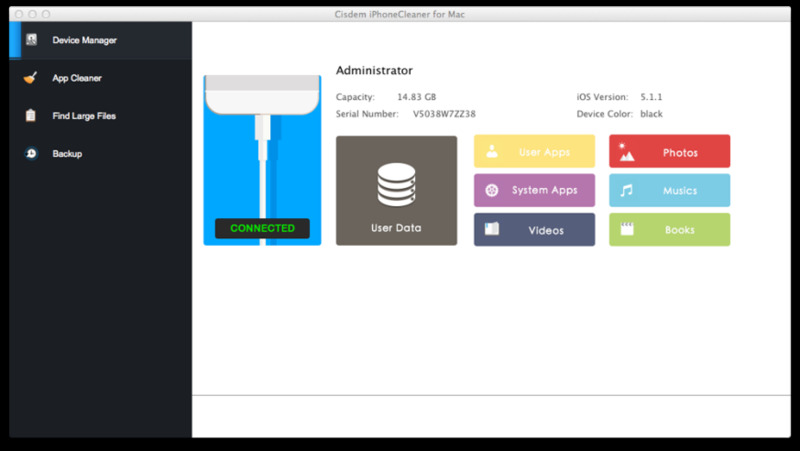 The Cisdem iPhoneCleaner for Mac is good option to find and take away spam from any gadget that runs iOS. With this cleaner, you can do a complete sweep to seek out temporary files that may be erased, as well as other documents that could be taking a lot of space as part of your device. For instance, empty folders, files left by apps which are uninstalled, program cache, apps which might infrequently be used, etc. It is an ultimate iPad cleaner that helps clean up the garbage for devices running on iOS, which allows you reclaim a lot of space for your iPhone. It's liable to bring you the hands-free cleaning, ultimate speed-up along with an array of innovative iOS maintaining features. Macgo iPhone Cleaner for Mac is a superb iPad cleaner and file explorer tool operated with Mac OS X. It is free by using it on only 1 Mac. It can tidy up most junk files on iPhone, iPad, iPod Touch to take back storage space for further fun securely. You can dig out redundant and useless files on the iPhone and strike them out with just three clicks. 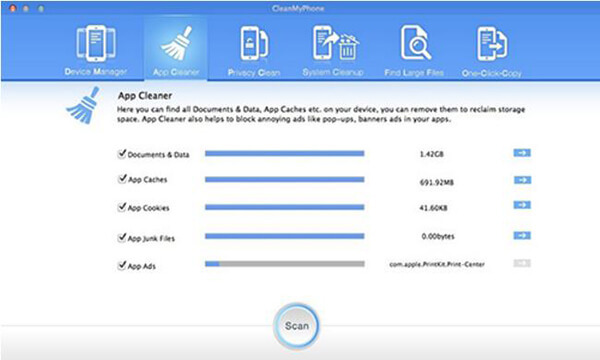 CleanMyPhone is made to free up space for storage on iOS devices by managing and removing apps and files through your iPad, iPhone or iPod touch. 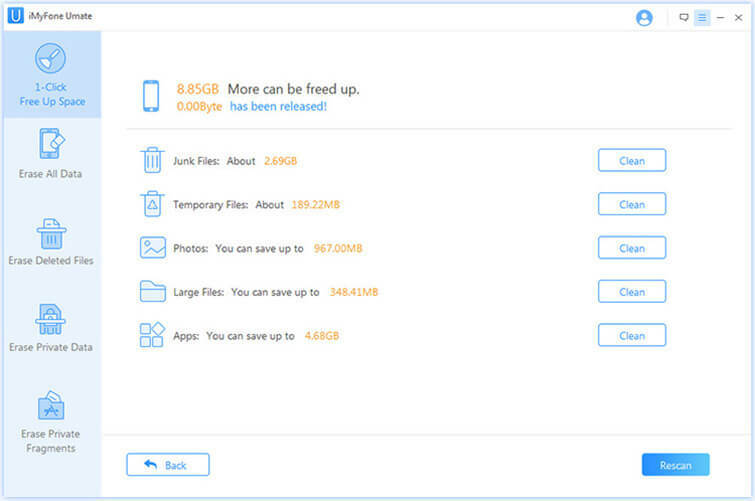 CleanMyPhone makes it possible to find out the big files quickly and tidy up the disk space. It cleans scripts, and cookies to guarantee the protection of your information and also protects your privacy. This part content is the most - watched post that most of users want to know. As the table shows below, we can see that only iMyFone Umate and Macgo iPhone Cleaner supply us with free version. However, Macgo iPhone Cleaner can only run on Mac. iMyFone Umate Free can run both on Mac and Windows. So if we really want to choose a powerful iPad cleaner app, iMyFone Umate is the best choice. Umate free is good, totally free but powerful. Get 3GB back for my iPhone. The comparison makes everything clear, great! I tried the freeware of umate pro, so good and so easy to use!